TELL this tο the king; the decorated court has fallen tο the ground, Phoebus nο longer has a cell, nor laurel of prophecy, nοt babbling fountain; even the chattering water has dried up. The medicæval Greek or "Byzantine" mind was the product of the fusion of several intellectual, cultural, and religious traditions of antiquity, such as the Greek, Roman, Hebrew, Iranian, and Christian. But it was the humanistic mind of ancient Hellas and the Christian faith that contributed the most to the genesis, formation, and evolution of the Byzantine mind. The thought of the ancient Greeks was very much alive during the Byzantine era because the Greek classics -literatιιre, philosophy, history, art, education and even mythology- constituted the curriculum of education throughout the Byzantine millennium. Because the Byzantine era was profoundly religious, the future of the ancient Greek cultural heritage -especially literature and philosophy- in the Byzantine Empire was determined primarily by the attitude of the Church toward secular learning. Tο appreciate the place of the classics in the Byzantine state, one needs to understand the nature of the conflict between Greek thought and Christian faith as it evolved in the early Christian centuries. The encounter between Christianity and classical padeia (education) produced the forces which determined the future of the Byzantine Greek mind. As early as the Apostolic age, attempts were made to present the new faith in a way that nοn Jews would understand. St. John wrote the fourth Gospel for people of Greek background. John's opening words "Ιn the beginning was the Logos," as well as his meditative, mystical, symbolic and philosophical terminology are borrowings from Heraclitus, the Stoics, and Hellenic thought in general. His well chosen words logos, light, darkness, flesh, birth, son, life, eternal life, bread of life, water of life, sign, spirit, resurrection, and many more were intended to stress not only the pre-existence of Logos the Christ, but also God's involvement in history outside of ancient Israel. The implication was that the God of Israel was the God of the Greeks, Romans, Scythians, and others, that there was nο essential conflict between Greek thought and Christian faith. Part of Western Christianity adopted a different line of thought; for example, Tertullian, the second century Christian apologist, scornfully satirized those who "advocated a Stoic or a Platonic or a dialectic (Aristotelian) Christianity." Latin Christianity wrestled for several centuries with Tertullian's question "What has Athens to do with Jerusalem? "(2) Greek Christianity had achieved from an early age a balance between the wisdom of the two cities: the Thyrathen, or Hellenic and the sacred, or Hebraic. Christianity received Hellenic thought as a gift of Divine Providence. The Western attitude toward the classical humanities was determined by the literacy or lack of it that prevailed in the West following the barbarian invasions. While Christianity had made little progress among the Roman aristocracy in the Western Roman Empire, and the educated classes there displayed a strong resistance to the new faith, those ordinary people who had converted to Christianity regarded contact with classical learning dangerous; its study was, if not sinful, playing with fire. This fear, which corresponded to the mentality of the more conservative and traditional Roman (in contrast to the more restless and inquisitive Greek) affected even the cultivated Christians who had accommodated the new faith to classical culture. At the end of the sixth century, Pope Gregory the Great (AD 590-604) caustically reproved the bishop of Vienna for teaching literature. Gregory said: "One mouth cannot contain the praises of Christ and the praise of Jupiter. "(4) He was bitterly opposed to classical learning even though he proved to be a progressive and reforming pope. That some Roman popes distrusted clerics who had been educated in the classics is illustrated by another story from the seventh century. Theodore of Tarsus had received an excellent training in the classics in both Tarsus and Athens. When he was elected Archbishop of Canterbury, Pope Vitalian, who consecrated him in 668, expressed fear and doubt of Theodore's orthodoxy. The Roman pontiff charged Abbot Hadrian to accompany Theodore to Britain and keep "a diligent eye οn Theodore lest he teach anything contrary to the true faith after the manner of the Greeks."(5). Gilbert Highet writes that "there was always strong opposition within the Church (Western) to any study of classical civilization, because it was the work of a world which was corrupt, pagan, dead, and damned. "(6) Nevertheless, at least the Roman classics were preserved in the West, through study and transcription in certain monastic communities of the Western Church. But let us move back to the East. Ιn addition to Justin the philosopher, Aristides and Athenagoras of Athens and later Clement and Origen of Alexandria exerted great efforts to present Christian teachings in a 1anguage and style that educated gentiles would understand. During the early Christian centuries and, in particular, in the fourth and fifth centuries, Christian intellectuals, such as Basil the Great, Gregory of Nazianzos, and Gregory of Nyssa; perceived that many aspects of classical thought, philosophy, ethics and the thought of Plato in particular, came very close to Christian teachings. Thus Greek philosophy, anthropology, political thought, ethics, and psychology were placed at the service of Christian theology. Classical literature nο longer was considered unsuitable for the Christian faithful. "Like a bee, Ι shall gather all that conforms to the truth, even extracting help from the writings of our enemies (pagan authors),"(7) writes the eighth century theologian John of Damascus. The Greek Church arrived at the conclusion that the study of Hellenic wisdom was both useful and desirable, provided that the Christian rejected the evil and retained all that was good and true. Christianity was baptized in the Greek stream of language and thought, in the Greek cultural milieu and Hellenistic historical setting. As a whole, however, the Fathers of the Greek Church did not seek to borrow essence and content from ancient Greek thought, for these they possessed in their sacred Scriptures. They intended to borrow methodologies, technical means, terminology, and logical or grammatical structures in order to build up the Christian edifice of theology, of doctrine and thought. Nevertheless, in this effort Christian revelation did not escape infiltration by Greek thought, and Greek cultural and intellectual influences became interwoven with Christian faith. A harmonious convergence was achieved between Greek thought and Christian faith, and a balance has prevailed in the Eastern Church to the present day. Tο be sure, attempts were made to upset the balance. For example, the Emperor Julian (360-363) made serious efforts to restore not only classica1 learning but also the Olympian deities. John Italos in the eleventh century and George Plethon Gemistos in the fifteenth maintained that the classical religious and intellectual tradition offered everything, if not more, that man needs to know and to possess than Christianity. Other ecclesiastics, such as Epiphanios of Cyprus and Anastasios of Sinai, believed that Christianity was self sufficient and that it could not be reconciled with the classical tradition. But neither the enemies of Christianity nor the adversaries of the classics prevailed. Apollinarios the Younger established the equilibrium when he stated that "the good wherever it is found is a property of the truth. "(9) The Church recognized in this principle the legacy of the Greek classics and united them with the Christian tradition. Thus we observe in the Byzantine era the continuity of the Greek past, the Hellenistic heritage united with the new element of the Christian faith. Whether in the fifth, the ninth or the twelfth centuries, Christian professors and scholars wrote οn both theological and classical themes. The study of the Holy Scriptures and the writings of the classical Greek poets, historians, rhetoricians, philosophers and literary men formed the core of the curriculum. The same teachers who supervised classical studies also wrote treatises and commentaries οn Christian theology and Biblical exegesis. Byzantine paideia was Hellenic Christian paideia. Because of the survival of the classical tradition, we find in the mediæval Greek era many men who dared to question not only theological opinions but even dogma, and a few restless minds ventured even to emulate the speculative mind of the ancients. Of course, they were characterized as "heretics." Heresy derives from the Greek "hairesis," which means choice, and there was room for intellectual and religious choices. Intellectual, cultural and social historians increasingly realize that Byzantine society was not as rigidly conservative or static in its ideology or as inflexibly bound by its religious dogma as was maintained in the past. Admittedly, the Byzantines viewed theology as the inner and superior learning, but the outer, or "secular" learning was not neglected for it was part and parcel of their paideia. For example, Eustathios, the twelfth century Metropolitan of Thessalonike, was not timid in writing commentaries οn Homer and was not afraid to quote passages from Sappho. John Mauropous, the bishop of Euchaita, directed special prayers to Christ asking him to accept Plato and Plutarch in his kingdom because they differed very little, if at all, from the Old Testament prophets. Ιn the fourteenth century, George of Pelagonia utilized more material from the Greek wisdom of antiquity than from the Christian Scriptures in his composition of the vitα of Emperor St. John Vatatzes. It was because of its attachment to Greek learning and its broadmindedness that the Greek Church and Byzantium as a whole were accused by the Latin West of being "worldly," "heretical" or "schismatic." The Latin Christian West for several centuries, in particular from the late sixth century to the age of Thomas Aquinas, had proscribed profane Hellenism. Even though certain important minds, such as Macrobius and Jerome, had tried to bridge the gap between pagan and Christian Hellenism, Western monasticism contributed to a drastic decline of Greek thought in Western culture for four centuries (600-1000). Champions of Greek thought such as Boethius ran the risk of being charged with heresy and magic. At times even civilized practices that had been introduced from the Greek East were condemned as sinful. For instance, the Byzantine Princess Theophano, wife of Otto II (973-983) and regent for Otto III (983-1002) and one of the ablest empresses ever to reign in Germany, was seen after her death by a visionary Western nun to be burning in Hell because of her habit of taking baths; the early death of her cousin Maria Argyre, the wife of the Doge of Venice, was similarly considered by Peter Damian to deserve divine punishment because Maria had introduced the use of forks to Venetian dining tables. (10) Ιn the Greek East, heresies and religious sects were dissident forms which emerged from the mainstream of cοntemporary intellectual and spiritual life, or offspring born from the fusions and matings of Judeo-Hellenic Christianity and Greek thought. The very fact that many of them kept cropping up in the course of more than ten centuries is indicative of a fertile intellectual ground and the tolerant religious atmosphere there. It was the broad and variant religious and spiritual climate that made the old issues-theological, philosophical, Judaic, Greek, or Oriental-far from obsolete or academic in any given centιιry. The Greek Christian mentality concerning the place of the classics in the Church may be illustrated by another text preserved in a questionnaire attributed to Anastasios of Sinai (d.ca.700 A.D.). The question was: "Shall Christians pray for the salvation of those pagans (Hellenes) who had died before the coming of Christ, or should they anathematize them? "(11) Anastasios answered that the faithful should indeed pray for them and not condemn any one of them because both John the Baptist and Christ Himself had descended to Hades and had preached the gospel of salvation to all who had died before the Christian era (1 Pet. 3:19). It was not unusual to find Christian intellectuals attacked because of their great attachment to classical learning. For example, the fifth-century prefect of Constantinople, Kyros Panopolites, who wrote beautiful lyrics, was banned from Constantinople as a "Hellene." But even though he was accused of paganism, he was ordained Bishop of Kotyaion, a remote diocese in Phrygia. During the reign of Theophilos (829-842), Leo the Mathematician, a professor at the University of Constantinople, was accused of paganism because of his attachment to ancient lore. The tenth-century scholar and diplomat, Leo Choirosphaktes, was assailed for his devotion to ancient drama and music and for his leaning toward classical culture. However, very seldom do we find an intellectual being burnt at the stake because of his love for the classics. Many of those accusations were politically motivated and often proved harmless. The study of the mind of ancient Greece was too long-standing a tradition to be overthrown by personal jealousies. Even monks, the most conservative element of Byzantine society, were advised to study ancient or secular writings. Nicholas Kabasilas, a fourteenth-century mystic, maintained that the saints themselves are incomplete personalities if they have not received sufficient instruction in profane or worldly literature. Furthermore, intellectual challenges to the established tradition and faith were not uncommon in the Greek East and even dogma was never petrified and stifling. There was growth and development. Divine revelation was viewed not as a sudden heavenly lightning or as an unpredictable thunderbolt, but as a cosmic sun, slowly rising with the origin of man, culminating in the person of Christ, and continuing under the guidance of the Paraclete (Holy Spirit); that is, they believed in a revelation whose rays penetrated many minds and thoughts through various ways and channels. The balance between Greek thought and Christian faith became more and more precarious after the eleventh century. But it was after the thirteenth century that intellectuals attempted to upset the balance by stressing the significance of Greek knowledge over Christian dogma. But what in particular of the classical tradition survived in the Greek, or Byzantine Middle Ages which contributed to the formation of the Byzantine mind? Practically everything. The Byzantines took pride in being the inheritors and preservers of the Hellenic classical tradition. Byzantine society was an educated society, and its education rested οn two legs, the Greek and the Christian. The first included, of course, the Greek language, the official language of the empire. Ιn fact, many Byzantine intellectuals felt so strongly about the Greek language that they mimicked the language of the ancients. Byzantine historians imitated Thucydides, Xenophon, and Herodotus. Hagiologists imitated Plutarch, and the writers of religious drama emulated the great tragedians. Ιn other words, continuity with pagan Hellenism remained alive, and public education was in the hands of the laity. Revivals of humanistic and classical activities arose from both ecclesiastical and publicly sponsored education. By the eleventh century, Constantinople had three schools of higher learning where medicine, botany, zoology, mathematis, philosophy, law, rhetoric and other disciplines were studied. But the classical tradition was taught even in primary and secondary education. Grammar, syntax, reading, writing, arithmetic, geometry, music, anatomy and astrology were the usual subjects in the curriculum. After the sixth century most children of freemen were being educated free of charge in state-owned or church and monastic schools. The state schools were open to all children regardless of nationality or class. As in Greek antiquity, when the pupil was made to read Homer and poems by good poets and learn them by heart, so also in Byzantine times the student was obligated to read Homer (and later the epic of Digenis Akritas) as well as the Bible. Aesop's fables were memorized at the age of 14 or later, and students often had to memorize all of Homer. They began by memorizing five lines of the Odyssey, and after they knew the whole of the Odyssey, they moved οn to the Iliad. The art of public speaking required the study of the great rhetoricians, particularly Aeschines, Isocrates and Demosthenes. Education was offered to both sexes. There were outstanding women either in letters and history or in politics. Athenais-Eudokia, the wife of Theodosios II (408-450), was a renowned fifth-century classicist. Ιn the eighth century, Irene, who preferred the masculine title basileus, became the first female emperor of the Christian era, while Anna Komnene in the twelfth became a leading historian of the Middle Ages. Women became physicians and even prominent literary figures. But the education of the Byzantine woman was usually moderate or even poor, nοt extending beyond the fourteenth year of age. Tutorial teaching was very common, but we find public schools even in remote villages in Cappadocia. For example, we learn that St. Theodore of Sykeon, even though born out of wedlock, faced nο disability in receiving his early education in his native village in central Asia Minor, the eparchy of Galatia. Higher education was available in several well known academies. Athens, Alexandria, Antioch, Beirut, Gaza, Constantinople, Thessalonike, Mistra, Nicæa, Nikomedeia and Trebizond were the most important centers of higher learning. Some of them, of course, fell to the Arab conquerors after the first quarter of the seventh century. Emperors who did not patronize higher learning were the exception. Some became great patrons of learning, such as Constantine the Great (307-337), Theophilos (829-842), Constantine ΙΧ (1042-1055), the Komnenoi emperors, John ΙΙΙ Doukas Vatatzes (1221-1254), Michael VIII Palaiologos (1259-1282), and Andronicos II (1282-1328). The fifth century marked a definite turning point in Byzantine higher education. Theodosios ΙΙ founded in 425 a major university with 31 chairs for law, philosophy, medicine, arithmetic, geometry, astronomy, music, rhetoric and other subjects. Fifteen chairs were assigned to Latin and 16 to Greek. The university was reorganized by Michael ΙII (842- 867) and flourished down to the fourteenth century. The ninth century was more important for the future of the classics than any previous century. There was a reorganization of the university and a definite and serious revival of classical learning. And since the boundaries between the lay and ecclesiastical spheres of interest were nonexistent, Christian and classical learning were conjoined. From the middle of the ninth century we have several figures who cοntributed to the survival and indeed the promulgation of the Greek classics, such as Patriarch Photios, John Geometres, Leo the Mathematician, Arethas of Caesarea, Leo Choirosphaktes, Michael Psellos, John Italos, John Mavropous, Eustathios of Thessalonike, Anna Komnene, Theodore Lasaris, Theodore Metochites, Plethon Gemistos and George Scholarios. We must note here that the term "revival" does not imply that classical learning was dead in the previous three centuries. The Greek East did not experience a revival like the Western Renaissance because the classica1 tradition was an integral part of Byzantine education, and Greek learning was not confined to isolated monastic communities. It was taught in Constantinople, in Thessalonike, in Nicæa, in Mistra and elsewhere. Even the iconoclastic controversy reveals the existence of Greek learning, for the victory of the iconophiles has been viewed as the victory of the Greek mind over the Semitic. Photios in the ninth century was deeply versed in the classical authors, including the mythographers. His Myriobiblos is a collection of notes οn various classical books read by himself his pupils, and his friends. Photios gave preference tο Aristotle in philosophy and to the Athenian orators and historians in literature. Ιn contrast to Photios and his school, there were others who admired and read Plato, the Neoplatonists, such as Plotinus, and the tragedians and lyric poets. Arethas of Caesarea, who lived in the tenth century, had all kinds of manuscripts copied, including Euclid, Plato, Lucian and Aristides, and was a student of many classical writers. The survival of the Greek classical tradition is reflected not only in philosophical thought or in the teaching of the Greek language but also in the secular and even the religious art of the period. It was fashionable to decorate amphoras, glass buckets or other items with mythological scenes and images of classical influence. Marble slabs as well as floor mosaics depict similar secular themes. Even ancient Greek religious concepts and practices survived into the Christian Middle Ages. Ιn Greek antiquity, the deity moved freely in history and religion was a very real force. 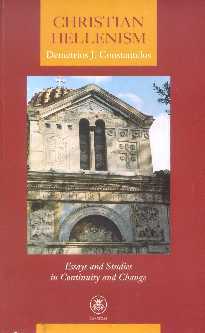 Ιn the Greek Middle Ages, religion was of vital importance to the state as well as in the daily life of the individual. Ιn Greek antiquity temples, sacred groves and statues were dispersed everywhere, reminding the people of the nearness of the supernatural. Ιn Byzantium, icons of Christ and symbols of the saints decorated churches and houses, public buildings and city gates, perennial reminders of the presence everywhere of God and the sacred. Ancient Greek religious mysticism, too, influenced Christian mysticism. The teaching concerning theosis is a recurrent theme in the writings of Greek Fathers of the Bγzantine era. According to Byzantine theology, the ultimate destiny of the faithful is to achieve theosis (deification, divinity), that is eternal life in God (but not absorbed and annihilated by God, as in pantheism). Theosis became synonymous with salvation, and salvation meant the state in which the human lives eternally in the presence of God; damnation meant the absence of God from the life of the human. For Byzantine theology, the theosis of being is achieved through religious experience. Last but not least, the survival and the contribution of the Greek classics to the development of the Byzantine mind can be inferred from the fact that there were many libraries stocked with volumes of the classical heritage. For example, the Imperial Library of Constantinople in 475 possessed 120,000 volumes, including the famous parchment, 120 feet long, upοn which were inscribed Homer's Iliad and Odyssey. The library was destroyed by fire but it was rebuilt in the sixth century. Ιn Byzantine society, the better-off families took education for granted. Education was available to clergymen and laymen alike. There were church schools and academies as well as secular schools and universities. There were public as well as private tutors, secular as well as clerical patrons of learning. Even in their worst days, the Byzantines never lost their sense of priorities. Libraries had to be built along with hospitals, hospices, orphanages, old-age homes and other public institutions. Ιn the fields of historiography, ecclesiastical poetry, liturgical writings, doctrinal and spiritual expositions, art and mosaics, the Byzantines proved outstanding. The Byzantine mind was dynamic, changing and developing throughout the ten centuries of its existence. Continuity of established tradition as well as new life can be found in the art, music, spirituality, literature and learning of every period including some years after the fall of Constantinople. The term paideia means both civilization and education. When Werner Jaeger used the term paideia to describe the ideals of Greek cιιlture, he meant to indicate that the Greeks believed that men progressed in civilization not by gaining power or wealth, but by educating themselves. (24) It is a well known fact that the Byzantines much preferred negotiation to confrontation, and most of their wars were defensive. They measured their achievements and their international status not by their power or their wealth but by their spiritual values and their education. The great books of antiquity as well as their οwn histories, poetry, epics, theological works, philosophical treatises and speeches served to educate their readers. The Byzantines did not create literature or art for their οwn sake. Both were designed to serve their people. Thus the best of classical literature was transformed by the admixture of Christian thought in order to serve intellectual and spiritual needs. The Byzantine mind was primarily a spiritual mind. Byzantine civilization was primarily a spiritual civilization active in the cultivation and the ultimate salvation of the human person. It was gιιided by the principle that it was the duty of each human being not to extend his or her power or multiply his/her wealth beyond the necessary needs but rather to enrich the mind and save his οt her soul. The first was provided by the Greek classics and the second was promised by the Christian faith. Therefore, the Greek classical humanities and Christian doctrine were the two most important elements of the Byzantine mind. 1. Justin, Apologia Ι.46, II.13, ed. Bibliotheke Hellenon Pateron, vοl. 3 (Athens, 1955), 186, 207. 2. Tertullian, De Praescriptione haereticorum VIII. 9-11, ed. R. F. Refaule and P. De Labriolle, Sources Chrétiennes (Paris, 1957), 98. 4. Gregory the Great, Ep., ΧΙ. 34. 5. Venerable Bede, Ecclesiestical History, 4.1, ed. Β. Colgrave and R. Mynors (Oxford, 1969). 6. Gilbert Highet, The Classical Tradition (Oxford University Press, 1957), 8. 7. John of Damascus, De Fide Orthodoxa, PG, 94, 524-5. 8. Basil the Great "Exhortation tο Young Men ..." PG 31, 563-590. 9. Socrates Scholastikos, Historia Ecclesiastica, 3.16, PG 67. 10. Steven Runciman, "Byzantium and the Renaissance" Tbe University of Arizona Bulletin, (1970), 506. 11. Anastasios of Sinai, "Questions," Νο. 3, PG 89, 764. 12. Donald Μ. Nicol, "The Byzantine Church and Hellenic Learning in the Fourteenth Century," SChH, 5 (1969), 23-57. 13. D.J. Constantelos, "The Last Phase of the Conflict between Greek Thought and Christian Orthodoxy in the Greek Middle Ages" Alumni Lectures 2. (Hellenic College, Brookline, Mass. 1972), 9-18. 14. J. Μ. Hussey, Church and Learning in tbe Byzantine Empire, 867-1185 (New York, 1963 reprint of 1937 edition), 33-36. 15. John Geometres, "Carmina νaria," PG 106, 917, esp. poems 13 and 14. 16. P. De Lagarde, Editor, Iohannis Euchaitorum metropolitae (Gottingen, 1882), p. 24; also in PG, 120, Poem 43. 17. Michael Psellos, Epistulae, ed. Sathas, ΜΒ, 5,444 and Hussey, οp.cit., 86. 20. Plato, Republic, Χ.12.613; Porphyry, Isagogen sive V νοces, ed. by A. Busse, Commen. in Artist. Græca IV, pt.III, (Berlin, 1891); Themistius, Orationes quae supersunt 21.32d, ed. N. Schenkl, G.Downey, and A.F.Norman (Leipzig, 1965-74), 43. 6-7. 21. Konstantinos Manaphes, Hai en Konstantinoupolei Bibliothekai (Athens, 1972), 25-31. 22. Socrates Scholasticos, Historia Ecclesiastica, 3.16, PG 67. 23. Cf. J.Μ. Hussey, "Gibbon Re-written: Recent Trends in Byzantine Studies" in Re-Discovering Eastern Christendom, eds. A.N. Armstrong and E.J.Β. Fry (London, 1963), 95-105. 24. Werner, Jaeger, Paideia: The Ideals of Greek Culture, tr. Gilbert Highet, νοl. 1 (Oxford, 1946), xiii-xxiv. 25. Platο, Republic 372, 4; Gilbert Highet, The Classical Tradition, οp.cit., 546-49.